Benefits of milk had no doubt. Almost all the nutrients found in milk of good quality. Protein and fat milk has a high ketecernaan properties. Vitamin and mineral content of milk is relatively complete. Milk can be consumed in various forms. There is nothing in the fresh or processed form, such as milk powder or condensed milk. 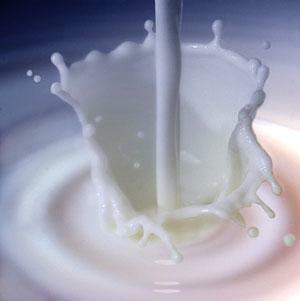 Humans also consume milk from food products containing milk, such as cheese, ice cream, and yogurt. However, there are still differences of opinion about the consumption of this milk. No group has claimed that the consumption of milk every day is not good for health, especially vascular diseases such as narrowing of blood vessels. The argument is, milk increases blood cholesterol levels risk factors for heart disease. Secondly, there is a positive relationship between average milk production per capita with deaths from heart disease in some countries. Other groups supporting the role of milk at a reduced risk of various degenerative diseases, such as heart disease, hypertension, and cancer. Recent studies in Norway to support it. Hjartäker together with colleagues from the Institute of Community Medicine, University of Tromso, Norway, through its publication in the International Journal of Cancer, proving that mengonsumi three or more glasses of milk every day can reduce the risk of breast cancer in premenopausal women. Through the study cohort the Norwegian Women and Cancer Study, they examined 48 844 women for six years and two months. Consumption of milk is measured by sending the form to the respondent history of food consumption. During this period, the team found 317 cases Hjartäker breast cancer patients. It turned out that the consumption of milk since the days of childhood negatively associated with the incidence of breast cancer when they were aged 34-39 years (premenopausal). That means that the consumption of milk since the days of childhood can reduce the risk of breast cancer. Consumption of milk in adulthood also reduces the risk of breast cancer after corrected by hormonal factors, body mass index, physical activity, and alcohol consumption. Women who do not consume milk run the risk of breast cancer 2 times greater than women who consumed milk 3 cups or more of milk every day.